Last night, Abby fell asleep in her recliner, and I went to bed several hours before she did. When she came to bed, at about 2:30am, Sierra the Chihuahua, as usual, jumped onto the ottoman by the foot of the bed, then into bed with us, but Max the Chihuahua hesitated and started vigorously rolling around on the carpet. We both called to him and encouraged him to join us, but a few seconds later it was clear why he wouldn’t … *sniff sniff* … Max just had his second close encounter with a skunk. Max had directly tangled with a skunk once before in 2010. 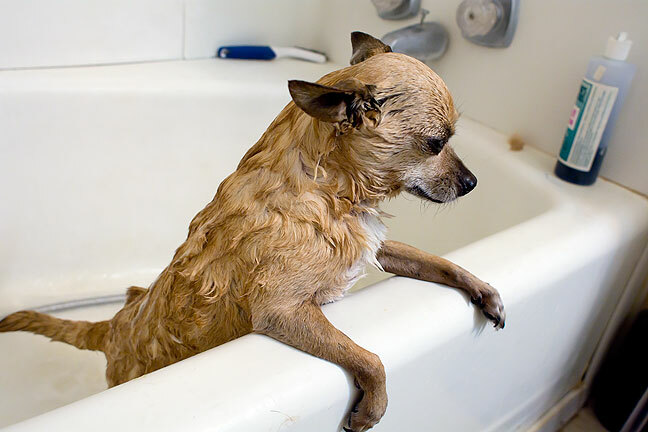 Max meekly accepted his fate of a double-bath after last night’s close encounter with a skunk. I gathered him up and took him into the bathroom, where I scrubbed him down twice with Plum Silky dog shampoo, and while it didn’t eliminate the smell, it helped. I shut the bedroom door and spent the rest of the night with him in the guest room so Abby and Sierra could sleep. Despite having Stinky Max under the covers with me, I slept, but dreamed, oddly, that an old girlfriend (Melissa) had taken my photography class, but was way overdressed, and a little slutty. Before ten minutes had gone by, she was dressed in shorts and a tank top, and left with a guy in a convertible. The other student in the class, Carl from work, wanted to watch Casablanca, so we spent a few minutes Instagramming the vo-tech, then let him watch the movie. The vo-tech staff and I then prepared cease-and-desist papers for Melissa’s father, but when I saw her arriving back to return to class, I made an effort to run and hide, and finally hide out in the cafeteria. He did it just so he could have a bath. I guess never learning to avoid skunks is better than never learning to stop chasing cars, which is what my dog Harry did, all those years ago. It was his favorite pastime, the only thing that really got his juices flowing, and something he was (unfortunately) very good at. I lost track of how many times he actually *caught* cars. If there is indeed a Happy Hunting Ground for dogs, my dog Harry is happily chasing cars.